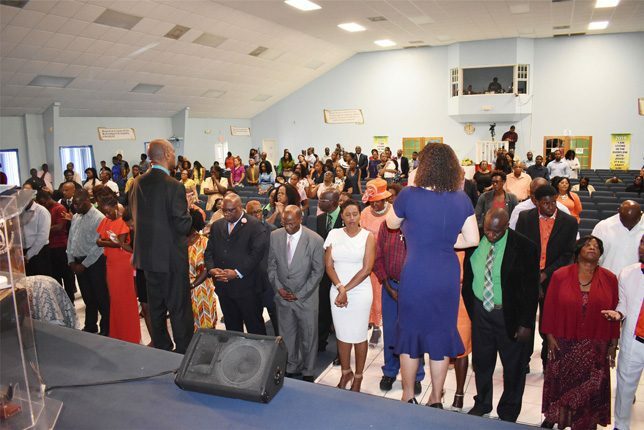 Apostle Isaac and Prophetess Isaac offer prayers for, among others, Prime Minister Harris (dark suit), Ambassador Powell (grey suit) and Senator Byron-Nisbett (white dress). Humble leader: Prophetess Debbie Isaac praying for Prime Minister, and National Political Leader of the Peoples Labour Party, Dr the Hon Timothy Harris. PLP Deputy National Political Leader, Senator the Hon Akilah Byron-Nisbett delivering remarks at the Rivers of Living Water Christian Centre in Lime Kiln, West Basseterre. 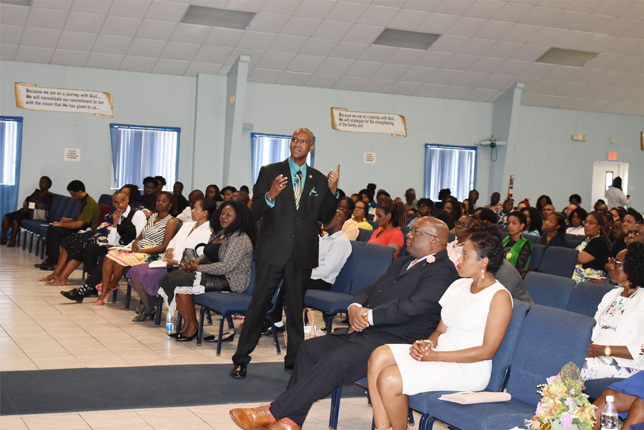 Apostle Dr Allan Isaac delivering the sermon at the Rivers of Living Water Christian Centre in Lime Kiln, West Basseterre on Sunday March 17. BASSETERRE, ST. KITTS, March 18, 2019 (PLP PR Media Inc.) — After holding a successful National Convention at the Patsy Allers Playfield on Saturday March 16, the executive and general membership of the Peoples Labour Party (PLP) led by the National Political Leader, Prime Minister Dr the Hon Timothy Harris, on Sunday worshipped at the Rivers of Living Water Christian Centre in Lime Kiln West Basseterre. The PLP team, which included the Deputy National Political Leader Senator the Hon Akilah Byron-Nisbett and the Planning Committee of the West Basseterre PLP Branch Executive, was welcomed to the Sunday worship service by Apostle Dr Allan Isaac, Prophetess Debbie Isaac, and the general membership. 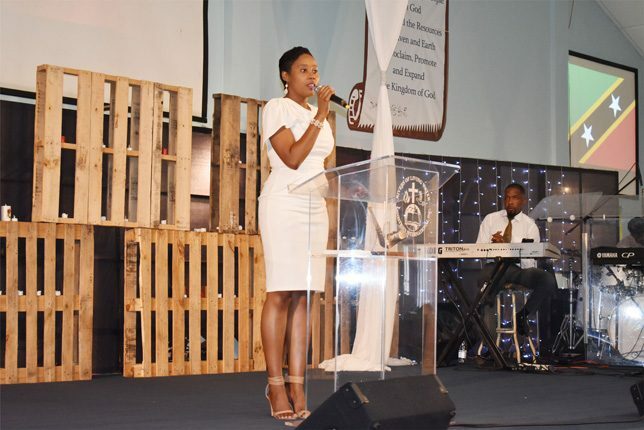 She told the congregation that when she travels overseas and people out there learn that leaders in St. Kitts and Nevis are coming to church, they tell her that all in the Federation are blessed. 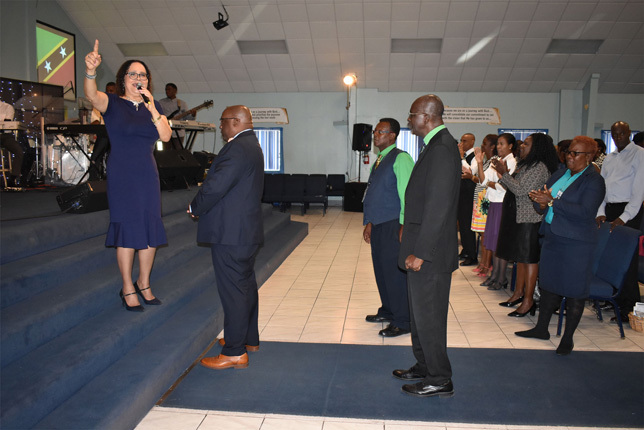 She noted that she would be told by those overseas that they do not see their leaders in years, but to have the leaders in St. Kitts and Nevis come to church and be so humble to even stand for prayer and even come to an altar that is something to give thanks for. When the Deputy National Political Leader of the Peoples Labour Party Senator the Hon Akilah Byron-Nisbett, was invited to give remarks she told the congregation that the party had just completed its National Convention and was starting its new year as a new executive. Also in congregation were Ambassador His Excellency Michael Powell, and Permanent Secretary in the Office of the Prime Minister Mr Osbert DeSuza.